Last week, Hellboy: Sword of Storms was nominated for a prime time Emmy for an animated production of an hour or more. It really is great to be nominated and a win would be nearly unbelievable at this point. But here's hoping! Starz Media's "Hellboy: Sword of Storms" has been nominated for an Emmy. Starz Media's Hellboy: Sword of Storms was nominated by the Academy of Television Arts & Sciences for Outstanding Animated Program (for Programming One Hour or More). Hellboy: Sword of Storms is in the running along with Cartoon Network's Good Wilt Hunting (Foster's Home For Imaginary Friends) and Where's Lazlo?, as well as Discovery Channel's Secrets of the Deep. Saturday memberships at the San Diego Comic Con are sold out! But if you already have your ticket and find yourself too tired and numb to move, feel free to flop down in a chair at my only panel appearance. Mike Mignola will be at his Hot Chocolate Booth for most of the weekend but his only panel appearance is Saturday afternoon. No news on another movie so you needn't ask. But for those of you who found this blog late in the game, check out the earliest posts documenting the thought process behind Hellboy. I think it's an interesting document. One of those early posts showed alternate designs for Hellboy. 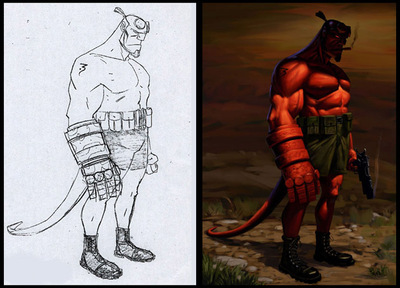 Tom Nelson, who returned to storyboard some of our strongest sequences submitted a Hellboy who looked like a boxer. I just saw this version of his design painted by Bill Dely and couldn't resist posting it. I'll be at San Diego Comic Con and on an animation panel on Saturday evening. Feel free to say "hi."